It's a Chen-Gackstatter surface of genus 1. An approximation of it anyway. Really it's just a plane with a handle. It's like a torus that has had one side split open so that the inside and outside are symmetrical. I made it because it is the simplest surface I could think of that has some slightly surprising properties, other than the Mobius strip. You can poke your fingers through the holes but the holes don't lead to the other side, they lead back to the same side. So there are two holes, one on each side of the sheet. This goes against our common idea of a hole being from one side of a sheet to the other. The holes wrap around each other in a nice way. The boundary of one defines the other. A bit like the yin-yang symbol but in 3D. In fact you could argue that this is the natural extension of the yin-yang symbol into 3D, if such a thing makes any sense. 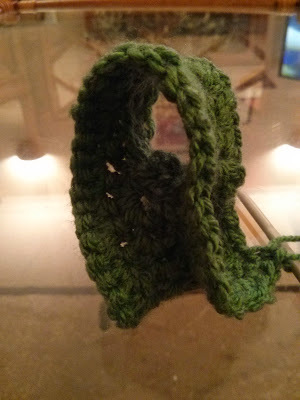 And then it was just a matter of continuing to add stitches in the same figure-8 loop around the edge. It actually came as a surprise when I realised that was all I needed to do. I'd planned to make it in two pieces and then join them at a seam but I'm glad I didn't need to. 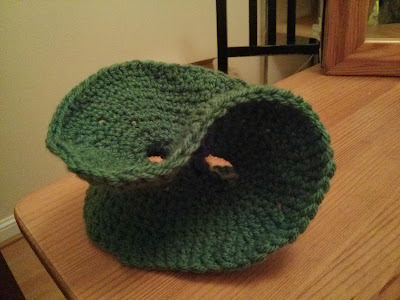 This use of crochet to explore maths is inspired by Daina Taimina's idea to crochet the hyperbolic plane. 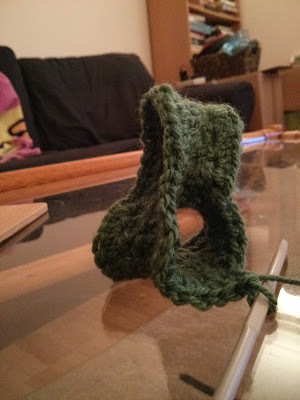 I wrote about that before, but it is only now that I'm getting round to trying the crochet myself. It's very interesting! 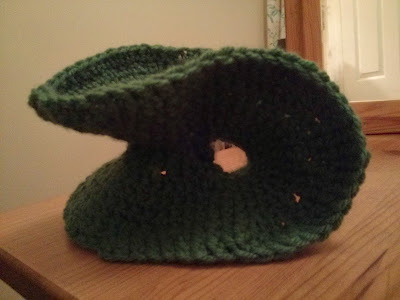 Daina Taimina showed us that you can change the curvature of the crocheted surface by adding more or fewer stitches around the edge as you go. Add too many and the edge ruffles up into what is called negative curvature and you get the hyperbolic plane. Add too few and the crochet pops into a dome shape, with positive curvature like a sphere. Presumably that's what the instructions tell you if you are crocheting a bobble hat. This surface has different curvature in different places, so it's a bit of a miracle when something vaguely pleasing comes out at the end.